New year is celebrated in India in various regions in March–April. India has a variety of calendars, some are lunar based, some are based on the Sun, some are luni-solar and some are Jovian i.e. Jupiter based. The New Year system is based on the cosmos, it begins when the Sun or the Moon enter the first point of Aries. During March/April, it is the moon that has entered, then the sun will enter the first point of Aries, which is celebrated as Vaisakhi, also a New Year day. So, half of India celebrates with the moon, and the other half celebrates with the sun. In Karnataka, Maharashtra, Andhra Pradesh, and many other Indian states, they celebrate the new year as per lunar calendar. Ugadi is the New Year in Andhra Pradesh, Karnataka, and Maharashtra. In Maharashtra it is known as Gudi Padva. This is celebrated on the first day after the new moon, which occurs closest to the vernal equinox. Since it is based on the moon it marks the New Year in a Chandramana calendar. Chandra is for moon and mana for measure. Close on heels to this, is the observance of the New Year by the other communities of the land following the Sauramana calendar, the calendar that measures the movement of the sun. In Kerala it is celebrated as Vishu, where first thing in the morning the family members are taken by the mother, to view VishuKani, an arrangement of flowers, fruits and a mirror – the first set of objects to be viewed on the start of a New Year. In Tamil Nadu it is celebrated as Puththandu, New Year or Varuda Pirappu, birth of a new year. In Sri Lanka, the same day is celebrated as the Sinhala New Year, Aluth Avurudda. In Orissa, it is celebrated as Bisuba, again coming from the root word Bisu or Vishu. In Nepal it is celebrated as Biska. In Bengal it is celebrated as Nabo Barsho. In Assam it is Bohag, Rangali Bihu. In Punjab, the New Year is welcomed as Baisakhi. Vishu, Bisuba, Biska, Bihu, all come from the same root word Vishu which stands for equinox. An equinox is when the Sun is exactly over the equator and the day and night are equal. The Indian word for equator is VisvadruttaRekha, meaning that which splits the world into two halves. The word Vishu thus denotes equal and a sense of balance. This point of balance of the sun, in its annual transit, served as an ideal point to start a New Year. It was an ideal time to take a reckoning of the skies and balance oneself, one’s accounts, one’s life, one’s relations and one’s goals before embarking on the next year. Across the land of India and also in most ancient civilizations this period, window of balanced time, came to be celebrated as the start of the new calendar year. It was the equinox, the sun being on the equator and crossing over to the northern hemisphere. So this was the right time for the start of a New Year across the world in the Northern Hemisphere. This New Year celebration was based on the movement of the sun. It was celebrated not only in different parts of India, but in Persia too, as Nowroz and also in different parts of Europe in the pre-medieval days. This shows that the people then lived in consonance with nature. What is interesting to note here is the use of the term Ugadi for this New Year. Adi is start, beginning. So Yuga Adi or Ugadi, denotes start of a Yuga. Even though it denotes the start of a New Year it is not called Varsha Adi but is instead called Yuga Adi. How does one come to terms with this term, since Yuga is usually correlated with a large span of time, whereas we are only moving into the next year? A Yuga is just not a long period of time as is generally thought to be. The word Yuga means alignment, like in Yoga which aligns body, mind and breath. Yuga is an alignment of astral bodies. 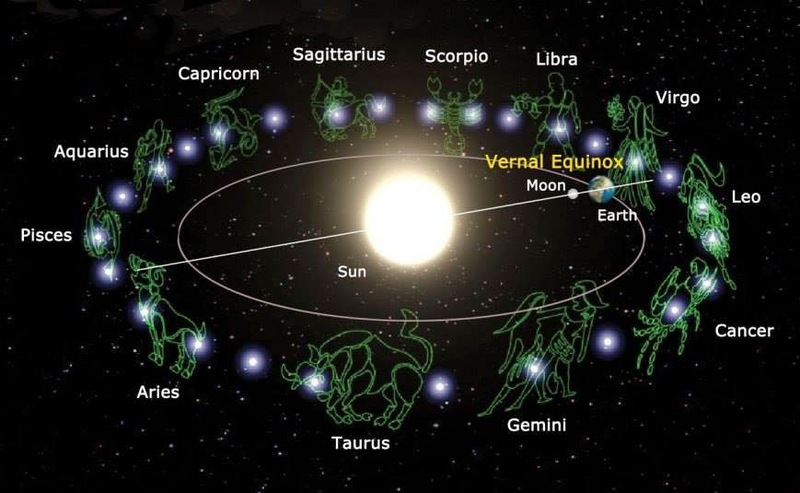 There are many such conjunctions, alignments that keep happening in the sky as the earth, moon and planets keep revolving around the sun, day in and day out. Each of these alignments occur at varying frequencies ranging from 1 year to 5 years to 60 years to 360 years to 26000 years to 4,32,000 years. Each of these alignments occur periodically and unfailingly. Each of these alignments serve as a means to track time at different scales. Each of these alignments is called a Yuga. Yuga thus is a generic time unit. Depending on the scale, it denotes different alignments and different periods of time. In the case of the New Year, a conjunction of the earth, sun and moon coming in alignment near the vernal equinox every year – a perfectly balanced point in the earth-sun-moon system, was deemed by our ancient, knowledgeable people as an apt milestone to usher in a New Day, a New Year and new hopes. Do you know the meaning of the names of all the months? Read 12 months and the Sanskrit connection to know more.